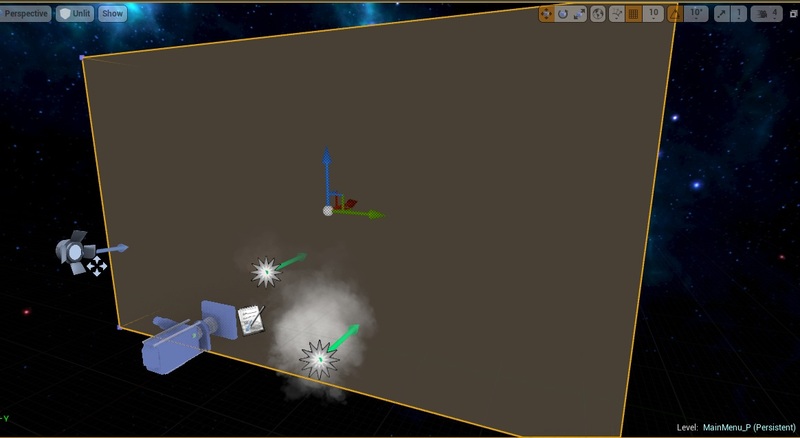 This post is important because it will cover Unreal Engine 4 streaming system which is powerful and everyone should learn how to use it. In this Tutorial I will show you guys how to create in-game loading screen using streaming. I think that streaming was added to Unreal Engine because of the big teams pipeline. Streaming can separate your maps so more people will be able to work on project in the same time. Thanks to this lot of people can work on one level without need to wait for others. As far I can know this is typical for games created in Unreal Engine. Lot of my friends used this method. Another thing is memory – if you are working with streaming enabled you could unload whole room if not visible for player. Create new (blank) level named MainMenu_P – “P” here means persistent. So your team mates will know that this is main map. In the meantime I have created simple MainMenu level. Try to create one too. 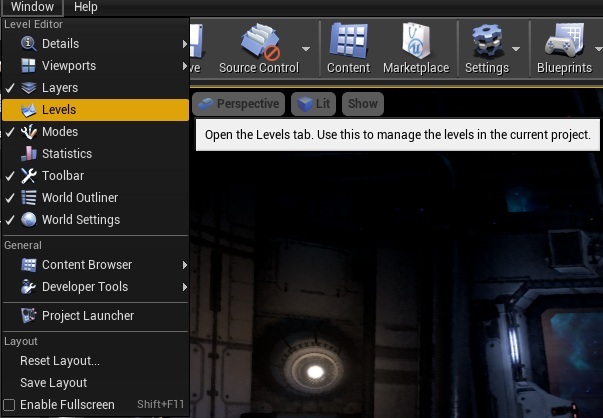 Now open MainMenu_P and select Window -> Levels. 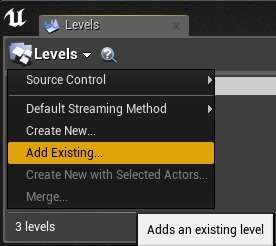 In Levels Window click on Levels -> Add Existing. And add MainMenu and MainMenu_Armory maps. 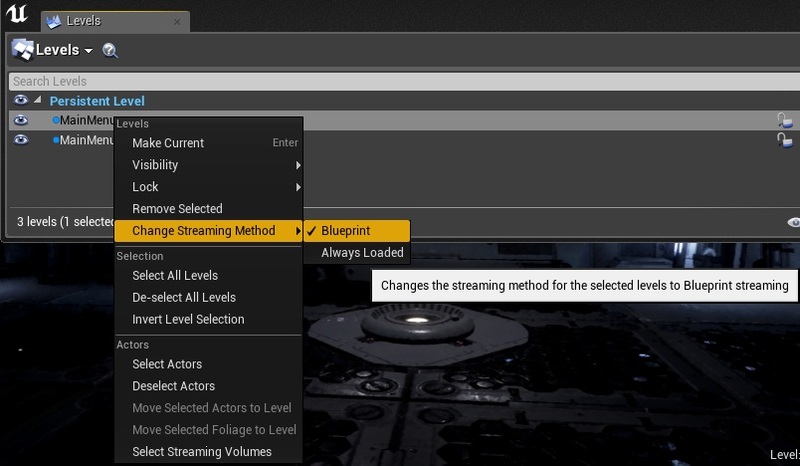 Make sure all maps have streaming method: Blueprint. Those steps have enabled streaming enabled pipeline. There is couple of things you need to know when working in Streaming. First and most important is which is current level? If I place new Actor to which level it will be added? Open Window -> Levels and double click on level which should be active. It will be marked as blue. If you open MainMenu_P – persistent level will be current level so always remember to change current level. 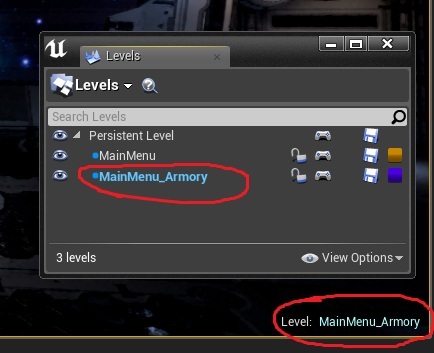 Another way is to open just MainMenu_Armory level instead of MainMenu_P. I know that this is easy but I have seen lot of people forgetting about this and placing lot of meshes / actors to persistent level. Another thing is MainMenu_P – which is persistent – that means it will be always loaded. Don’t put your content there. 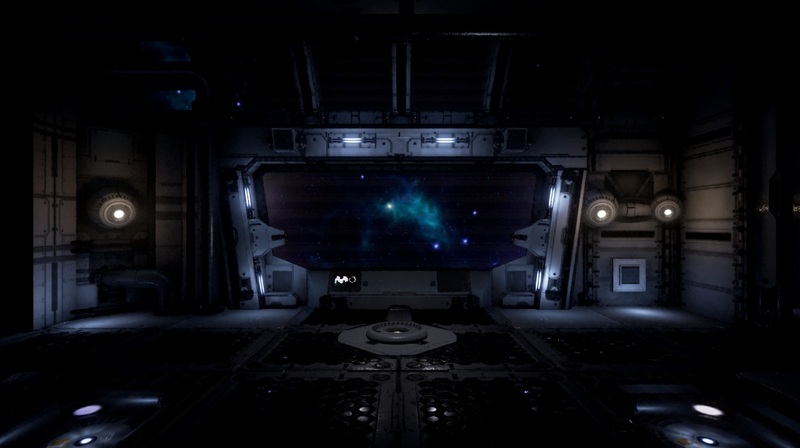 In this tutorial I will use MainMenu_P for loading screen adding one actor and one particle but don’t try to put whole level in there. How you will know which actor is in which level? Just use Outliner. 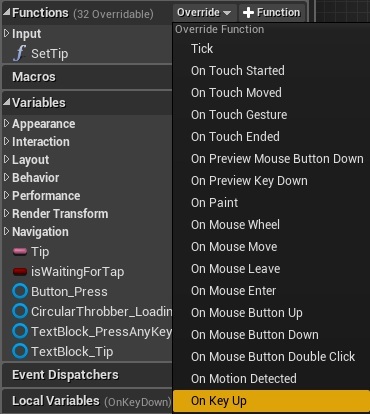 Thanks to this you can select all actors in MainMenu_Armory and move it right to MainMenu. In this example location 0, 0, 0 will be used for loading so rest actors should be away from center world location. Create new GameState blueprint named MenuGameState. Assign them to MenuGameMode and select MenuGameMode in MainMenu_P settings. Create blueprint extending BP_BaseLoadingTip named Loading_Trooper. Open it and add skel mesh component with Trooper Skel Mesh. Add some text to Tip variable. 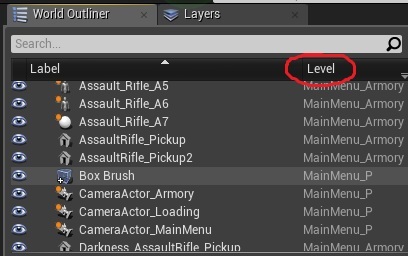 Create another blueprint extending from BP_BaseLoadingTip named Loading_Rifle. Basically just extend from BP_BaseLoadingTip to create new tip for loading. Game State will be responsible for the whole loop. Tip (Text), – Tip variable should be binded to TextBlock_Tip! Create new Custom Event named OnLoadingFinished. This is basically showing Press Any Key text and hiding Throbber. This looks complicated because I’m using UnBind functions without them it’s really simple. I have learned that before Removing Widget it’s recommended to unbind all bindings to prevent crashes when opening new levels. Each time we will use a key this function will popup. So if we know that loading was completed (isWaitingForTap bool) we can call OnPressed. USEFUL TIP: Key functions will only trigger when Input Mode is set to UI Only and widget is connected to Widget To Focus. Will show that later in this Tutorial. Last thing in UMG is to add OnClicked event on Button. Just call OnPressed function. It will be background for loading. This is basically taking random tip actor from TipActors -> spawning it -> let GameState know that Tip Actor was spawned. So UMG will get this dispatcher. Here should be all of your streaming levels you want to load during loading. After loading we are letting Game State know calling OnLevelCompleted. Now in Begin Play we need to set view to loading camera and bind event OnPressedKey to change the camera. And that’s all in Level Blueprint. Make sure your sublevels aren’t changing camera on Begin Play. Without Input Mode UIONly and In Widget To Focus – widget won’t get Key events. That’s all – you have your loading completed! When you stream load you can’t change the Game Mode (and all other sub classes), doesn’t it? Which you’d want to do when transitioning from the MainMenu and InGame (or Level 1, whatever) levels. Is this not the case? Persistent level will have information about game mode. I will have two persistent levels: main menu and ingame. You dont need to stream menu with ingame. For some reason nothing in the event construct in the UILoading widget is firing. I’m in 4.10. Will try to debug and re-post. Print string shows the widget being drawn correctly and everything else; not sure what’s happening yet. I’ve fixed it, but I’m not sure how. I put a million print strings throughout the project to track everything, and Event Construct would never fire off, no matter what. Finally I tried cutting everything and pasting into event begin play in the mainmenu game state, but you can’t really do that without also moving the onpressed function and everything else. When I pasted everything back into UI Loading and reconnected the event construct, it worked. I notice that “OnLoadingFinished” was not present when I pasted back. Recreating the link between OnLoadingFinished and GM_LoadingCompleted, and recompiling, seems to have done the trick. Very strange, it’s clearly a bug but I’m not sure what repro steps I could send to Epic.